Grey Goo, which we're revealing exclusively today, is a self-conscious throwback to the early days of the RTS genre, from the studio whose veteran staff laid some of the genre's foundations. It's a base-building, resource-harvesting RTS that throws most unit micro-management aside and puts the focuses on the big-picture “macro” decisions that once powered games like Command and Conquer and Total Annihilation. Underneath its retro sensibilities, however, is a thoroughly modern take on a classic design, one that owes more to MOBAs than to the recent efforts of studios such as Relic or Blizzard. This isn't a game about learning build orders or memorizing piles of hotkeys. This is an RTS that wants to get out of your way as quickly as possible so you can focus on smashing armies together. Petroglyph Games is a direct descendant of Westwood Studios, the developer that helped create the RTS genre with Dune II and then helped take it mainstream with Command & Conquer. Petroglyph emerged after Electronic Arts acquired Westwood and tried to relocate the longtime Las Vegas developers to EA's Los Angeles facilities. The impending move (and the L.A. real-estate market) forced the remaining Westwood vets to choose between their lives in Vegas and an uncertain future at EA Los Angeles. Westwood's core team to make a hard choice about their future, and Petroglyph was founded by the team that stayed behind. Since then, Petroglpyh have been one of the few independent RTS studios. Its last project was Trion's troubled End of Nations, an MMO-RTS that never quite seemed to find a good reason for the first half of the acronym. Petroglyph were eventually let go from the project as Trion took End of Nations internal (and subsequently put it "on hold"), and was left looking for new work. Grey Box is the new and mysterious publisher behind Grey Goo. That's not an attempt at drama. Every time I tried to find out something about who Grey Box is, and where it comes from, Petroglyph and Grey Box's representatives ducked the question. While Grey Box itself remains a mystery, its intentions with Grey Goo are clear. It is the inaugural game for the publisher, and one it hopes will establish a strong fictional universe for other projects currently in the pipeline. That's why it's working with WETA Workshop (the propmasters behind the Lord of the Rings series and District 9) to help establish an aesthetic for Grey Goo. But first and foremost, the company wants to make the kind of RTS that we haven't seen in years. The first thing I notice as I sit down to play Grey Goo is that the controls are all based off of the QWERTY row on your keyboard, like a MOBA. While most RTS hotkeys can be extremely esoteric, Grey Goo uses a simple tiered menu system. So you have a choice of producing buildings, light units, heavies, air—and once you key into that next submenu, you get a new set of options using the same keys. With practice, it becomes fast and effortless. I spend most of my time with Grey Goo's meat-and-potatoes faction, the Beta. They're an industrial alien race, with beefy builds and an extra set of small, nimble hands. Tactically speaking, they establish outposts across the map and fight with heavy armor and artillery. Another, more futuristic race employs a different dynamic, connecting everything to a central hub. They have to play a Tetris-like expansion game of laying down conduit, planting new structures, and teleporting existing structures closer to the front line. While there's a lot of faction asymmetry in Grey Goo, Zoboki says the team tried to avoid having too many “hard counters” in the game. Instead, the idea is to keep evolving your unit composition in response to what you're encountering on the battlefield. Advantage accrues to the player that keeps making the right adjustments to the mix of units and combat tactics. Grey Goo plays like a lavishly produced, fundamentally simple RTS. That's good in some ways. However, there are also moments it feels perhaps too much like a return to the good old days. The units were so versatile that army size, not composition, seemed like the deciding factor. The maps are gloriously lavish, like playing at RTS set in the world of Avatar, but they are also predominantly decorative. The most interesting visual elements are used to demarcate unplayable space, and much of the warfare plays out in open clearings or narrow chokes. Given how the different factions use the map, that may not be such a problem, but the terrain feels almost tactically featureless. On the other hand, we've played games with ever more sophistication and complexity that appeal to a demanding competitive audience for years now. Different terrain types, modular unit design, special abilities... all of these things reward players whose minds work at a few hundred actions-per-minute. But that's not most people. It never was. The RTS genre was built in part by games like Grey Goo: where players gathered resources, built an army, and then tried to blast through enemies to get at their base and harvesters. 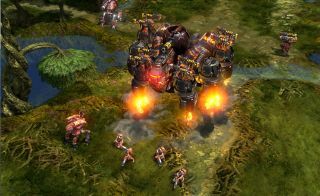 Grey Goo is remarkable not for what it has added to the RTS formula, but what it has stripped away.